I hate casinos. I think I like the idea of Las Vegas as a place to visit to see the shows and the wonder that is Vegas, but I have no desire to actually gamble. It seems like you could just as easily walk into the casino and just hand them your money and walk back out. 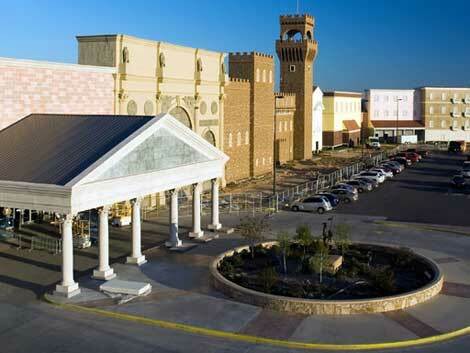 Here is perhaps the least attractive casino we saw on our way: Winstar World Casino in Thackerville, Oklahoma (just across the Oklahoma border from Texas). We went through the Flint Hills of Kansas. Very beautiful landscape and different from what I thought Kansas would look like. 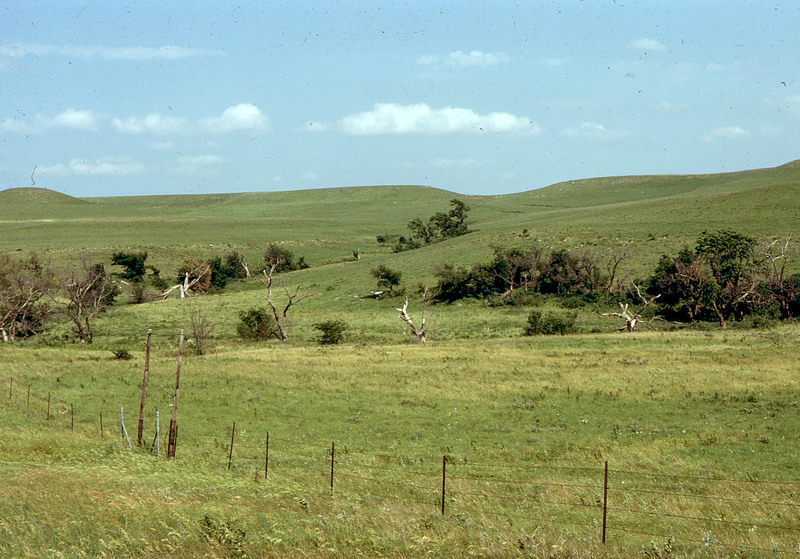 This area has the most dense coverage of intact tall grass prairie in North America. Breathtaking. I’ve been to the Missouri side of KC, but never the Kansas side. We spent the night in Kansas City, Missouri. 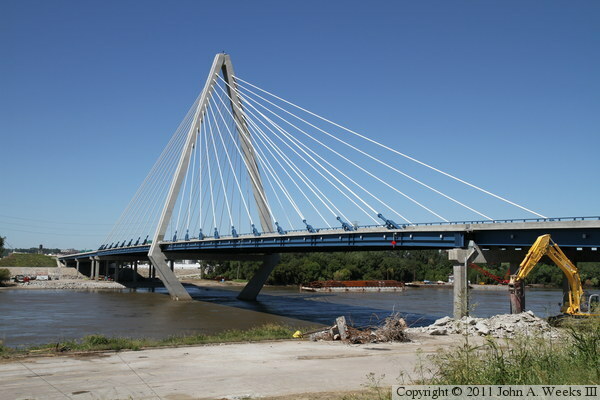 It sits at the junction of the Missouri and Kansas rivers. They call the Kansas side “KCK” and the Missouri side “Kansas City.” I took this picture from our car—ha! I don’t remember too much about Missouri. So much for the “show-me-state”! In their defense, we just cut up from Kansas City into Iowa. I think we crossed the Bond Bridge. I can’t remember if we crossed it or saw it from another bridge. 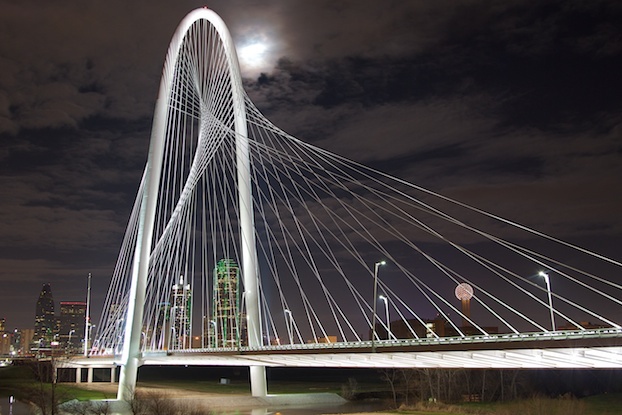 It does remind me of the Hunt Hill Bridge in Dallas which is just a few miles from our house. We cross it twice a day from Oak Cliff into Dallas to get to either my workplace or my husband’s business. Of course, I guess all suspension bridges look the same. 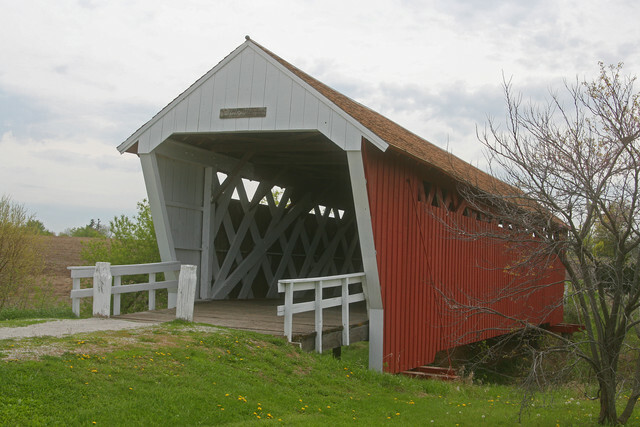 When we got to Iowa we stopped directly off of I-35 to see one of the “Bridges of Madison County.” I was much more impressed by the bridge than the movie. The one thing I have to say about Iowa is that they sure have a lot of corn growing there. Oh and wind turbines. Wind turbines in the middle of corn fields. Rolling corn fields. Miles and miles of corn fields and lots of wind turbines. It’s difficult to effectively convey the amount of corn growing in Iowa. I could say a bazillion acres and it would still be a grossly underreported amount of corn. Lots of corn. Welcome to Minnesota! We drove by the Spam Museum in Austin, Minnesota but didn’t have time to stop. I personally hate Spam but I have a co-worker who loves it. 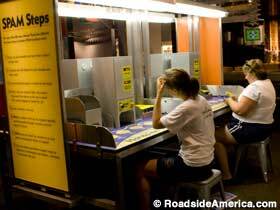 Someday I’ll go back and tour the Spam museum. Just like some day I”ll go to Graceland instead of just driving by it. I’m completely honest when I say that I’m sorry I missed the opportunity to join the mock Spam assembly line. Yeah Wisconsin! Sheboygan is awesome! The downtown is beautiful. The cheese curds are pretty wonderful. I thought they would be white cheese (like a mozzarella) but they were yellow (like cheddar). Pretty delish. And Lake Michigan was pretty. 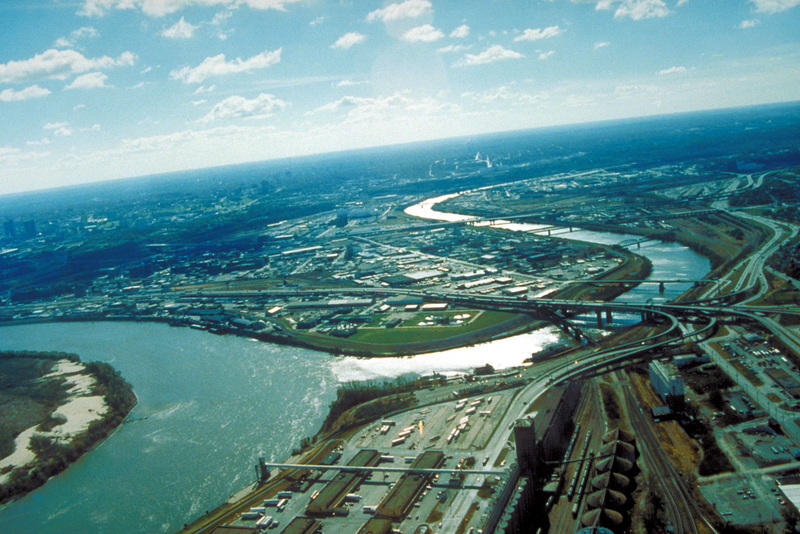 I lived on Lake Erie for a few years but we had large bolder shorelines where I lived. 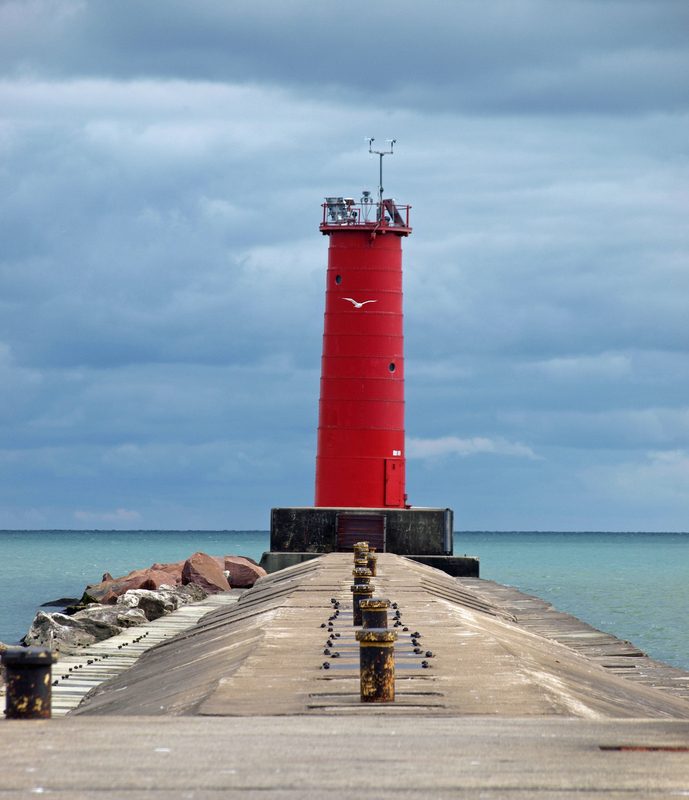 Sheboygan has sandy beaches and a lighthouse. Having grown up in Florida it seems weird to see that much water and gulls without smelling the salty breeze. I flew back from Milwaukee and changed plans in St. Louis. I’ve driven passed the Arch before, but flying over it was kind of surreal. It’s much tinier from the plane. So, 7 States in two days (counting Texas) and a quick trip lasting 4 days total. And I was lucky to spend some quality time with a great friend who will be missed terribly. We can’t wait until she and her husband get transferred back (crossing our fingers it’s no longer than 2 years). Meanwhile, we’re planning a girls day out in Chicago next summer! 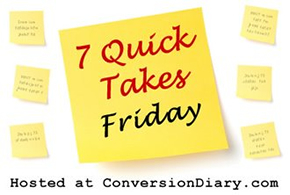 This entry was posted in 7 Quick Takes, travel, vacation. Bookmark the permalink. The Flint Hills are gorgeous. And there’s a wind farm out in western Kansas along I 70 that goes on for twenty-three miles. It was pretty cool. That part of Missouri is pretty remote. I’ve lived here all my life and never gone that route up to Iowa. WAit, that’s not true, I drove it on the way home from grad school once, but it was the middle of the night. There is Conception Abbey up in that neck of the woods, though, and I’m dying to get there for a retreat one of these days, exactly because it’s so remote. As for the St. Louis arch, there’s just something about that structure. I never get tired of seeing it, no matter how many times I drive through STL. When my friends are off having adventures and I start to feel sorry for myself, I list all the places in I’ve been and I realize I’ve been lucky enough to travel around the US and have really seen some neat things.